I found the brief very difficult this time, as nature is such a wide subject and I struggled to pin down my ideas. Eventually I fixed on the notion that nature will re-colonise any patch of land, given the time and opportunity. This would reflect in the way that a neat garden would be overtaken by wild flowers, and become more random. 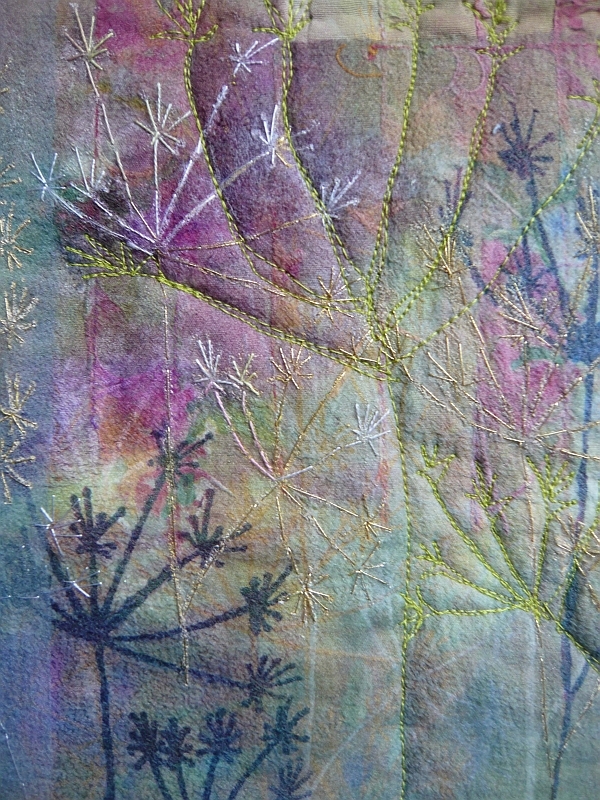 I chose a random dyed base fabric as the background, which I screen printed with images of wild flowers (cow parsley, I think), with a denser concentration of wild flowers at the bottom of the piece. I used a flowery patterned paper napkin as the main element of the formal garden. I stitched into this in an uneven grid, so that when the tissue was wetted and rubbed away, more of the pattern remained in the area where the grid lines are closer together. The garden elements were emphasised by additional pictures of flowers, cut from seed patterns. The surface of the paper covered sections were ‘stabilised’ using gel fabric medium, before further embellishment with flowers cut from dyed lace and felt. I transfer printed a sheer fabric with random green, yellow and purple colours before adding more screen prints of wild flowers to this. The sheer was then bonded to the background fabric to give a layered set of wild flower images. 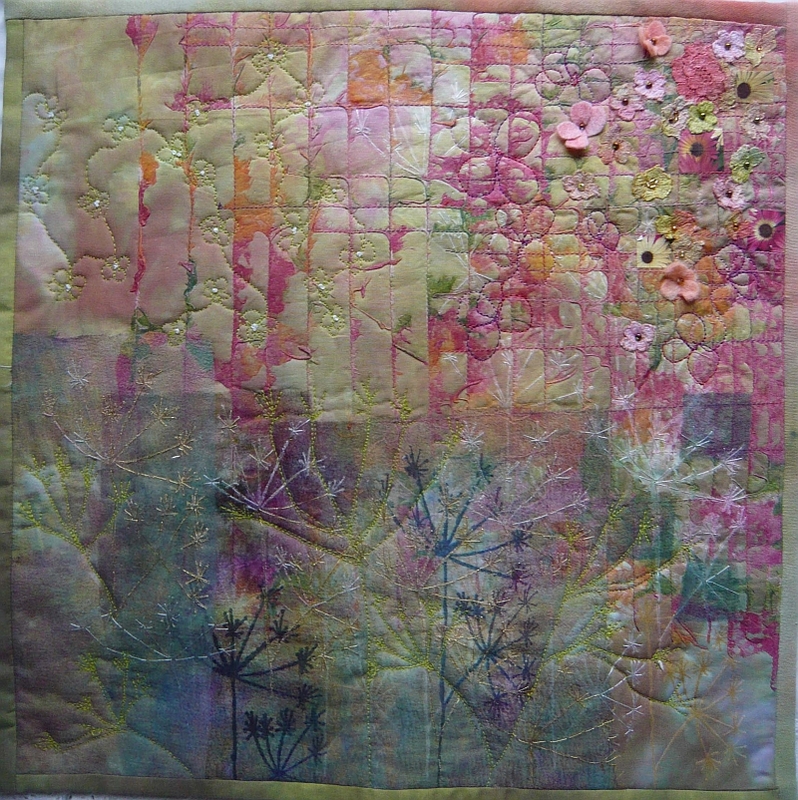 Quilting was added to this section using the same wild flower design, to give a further layer. I hoped that this layering would give a depth which suggested the dense, tangled and haphazard properties of nature. 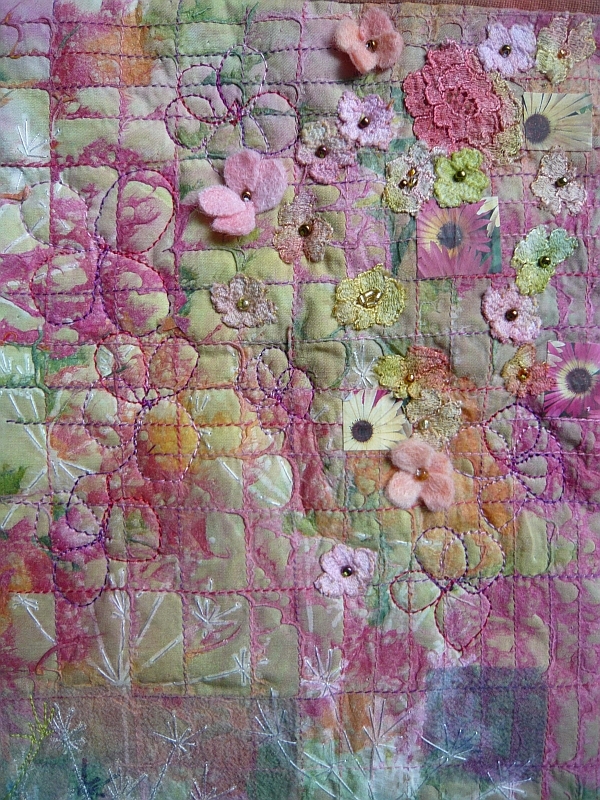 I used a rough flower petal design in the quilting of the garden section, together with the addition of beads to ‘quilt’ through all of the layers. Though the final product may not be a masterpiece, it is something which I enjoyed doing, and which I learned from. That is an awesome little piece ,full of great techniques ,most appealingly applied .just love . What a masterpiece ,full of great little techniques most appealingly applied .Just love it ! I really like your imaginative use of materials…and the “wild” plant — which to my mind looks like dill, something that often self-seeds in my garden — is stitched wonderfully at the bottom of the piece. You may have found it difficult but the result is beautiful Joan ! Bravo ! Thank you for your comments ladies. Perhaps the piece reflects the enjoyment I found in doing it. However my photography still leaves something to be desired, as the colours seem to have ‘lost something in the translation’.